The very first thing that drew me toward Monstrous was the cover, because Kymera really is and adorable thing. The other part was the synopsis of the story itself sounded too cute to pass up. A MiddleGrade mash-up of Frankenstein and the Brothers Grim. Yup, I'm sold. Plus, since it's a debut novel that makes it a BINGO book. Really before I even cracked it opened Monstrous had checked all the right boxes. Luckily for me it didn't really disappoint me. 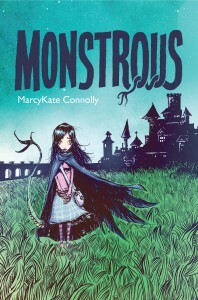 Monstrous is an adorable fantasy for any MiddleGrade reader to pick up. You see the entire world from Kymera's point of view from the first day she wakes up in father's laboratory until the final pages of her defending Bryer from the evil wizard. It was hard not to fall in love with her as a main character because she so wants to do the right thing. Despite all the obstacles put in front of her, the betrayals, and wrong decisions she never gives up. Which I think was my favorite part of the story. MarcyKate Connolly wrote a female character that made mistakes, was flawed, and didn't look like other girls at all. In fact Kymera is true to name and is three different creatures: a human girl with the tail of snake and the wings of raven. Despite all of it Kymera stays true to herself and I felt like it was something girls reading MiddleGrade novels need to hear. They need to see a girl who falls in love but isn't loved back who realizes it's okay because they are special in their own. It's also a great story on why you should never judge a book by it's cover. Kymera was more than just her parts. Of course that's just the message from the book all around. To never give up even when it seems impossible. No matter how people look at you, sometimes you have to believe in yourself and what you can do. It's a great story for the boys too. Ren, Kymera's crush, is strong and brave and also a bit flawed. Only he learns to forgive and apologize. Did I mention he's brave. The story itself was wonderful. The world of Byre was opened through Kymera's eyes and I honestly felt I was on the journey with her. It really did feel like a little Kingdom taken from the Grim stories, but told in a way for kids. It was adorable and toward the end I couldn't put it down. Really the only downside of Monstrous was that a few chapters in I had figured out who our evil wizard was. Which is probably because either I'm a little over the age bracket this was written for, or maybe that was what MarcyKate Connolly wanted. She wanted the readers to know who the wizard was, but for us to have sit and see Kymera figure out and kind of break our hearts when she did. Either way it didn't stop me from plowing through. Personally I thought it was adorable book and a great way to start of my reading of 2016 on a high note. I've already recommended to my friend as something she could read to my niece before bed, and I've put it on my cousins to read list as well. I've already put the second book, Ravenous, on my Hold list from the library, and it comes out February 9th of this year. I total recommend Monstrous to anyone who wants a fun quick read that leaving you smiling. Anyone with kids that love fantasy books. Even those that are fans of the Brothers Grim. Basically if you pick up a MiddleGrade novel here and there, and you should because they are adorable things, Monstrous should make the list.